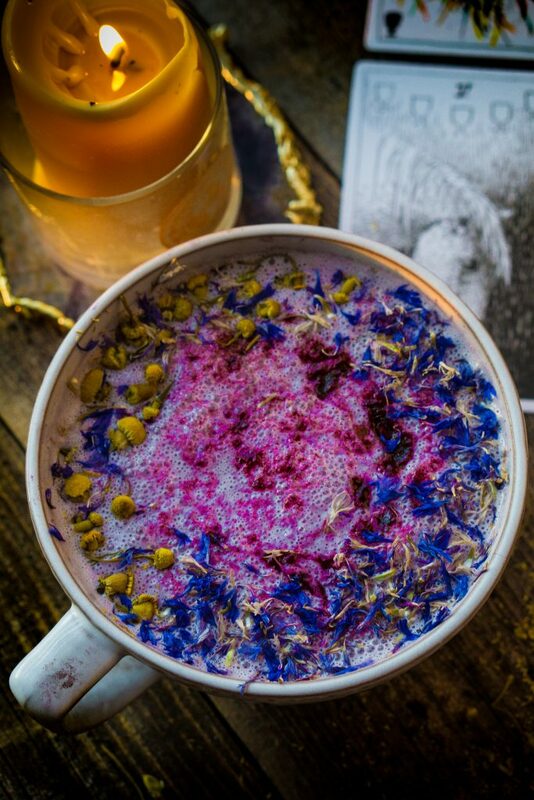 Flower Berry Moon Milk (vegan, paleo, keto, & body ecology) is the most magical milk you may ever make. It will help calm & nourish you. This past full moon in Leo and Solar Eclipse was a wild one. Especially emotionally speaking, so I thought I would make an easy moon milk. I always find that they help bring me into balance and the bright colors & flowers are the best pick me up. 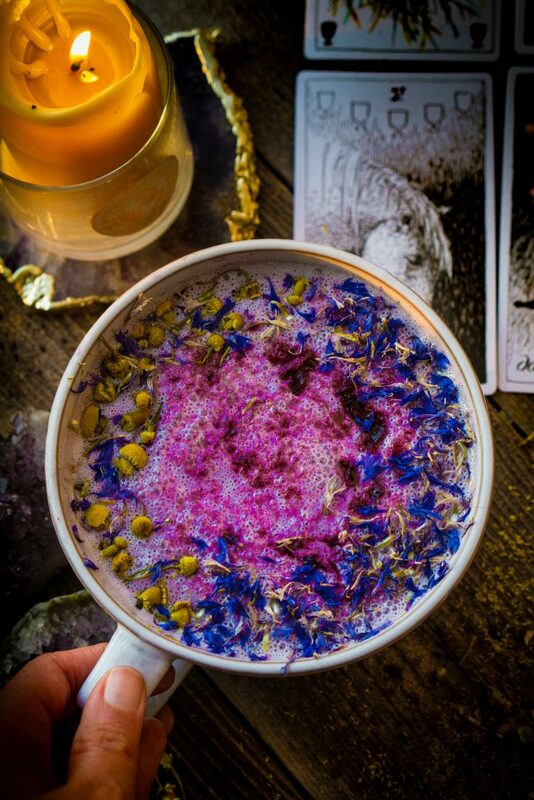 This moon milk is very gentle and filled with berry powders. It is only sweetened with stevia, so feel free to add any other sweetener of your choice. Chamomile is really star and healer of the show, with its powerful healing and nourishing properties. I swear whenever I drink Chamomile it puts my mind and body at ease and I am ready to relax and snuggle into bed with a good book. Who could ask for anything more during a hectic time of their life? The flowers will help to nourish you, ground you and bring you back to life. The berries will provide you with all the antioxidants to protect and recharge you. If you really want to you, you can make a whole ritual out of myself the moon milk. 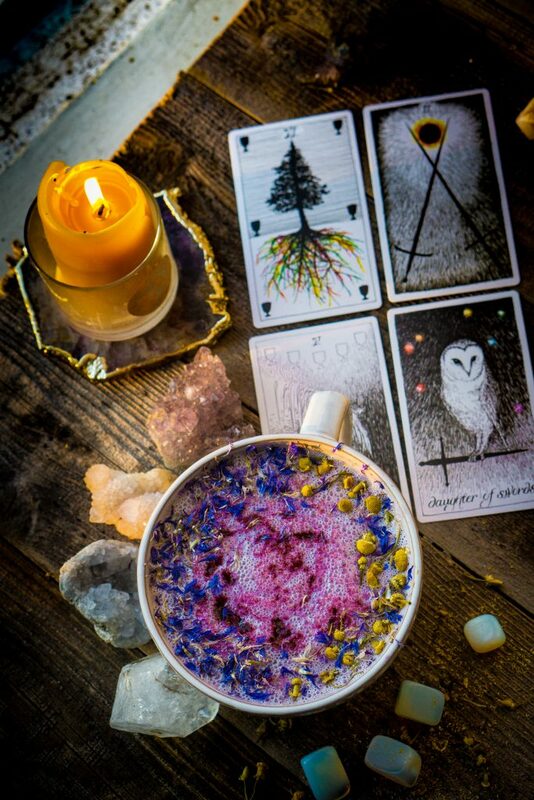 My personal ritual is to pull a couple tarot cards, burn a candle, light some palo santo, sage, journal, with some soothing tunes, and sip on my moon milk. It’s especially helpful on a full moon, new moon or when I just need to call back my own energy. I used a berry powder blend from Unicorn Superfoods but feel free to use any blend of berries such as acai berry, blueberry, pomegranate, goji, blackberry, raspberry or cranberry.